Based on the book series by P.L. Travers and the 1964 film of the same name, Mary Poppins is the tale of a nanny living in London. Zizi Strallen reprises the role as Mary Poppins, after a successful run as the same character during a UK and Ireland tour in 2015. Zizi’s performance as Fran in Strictly Ballroom won her accolades from critics and the audience and undoubtedly played a factor in her selection. Charlie Stemp also joins the cast, following an award-winning performance in Half A Sixpence. The feel-good musical features some of the original hits from the 1964 film, such as “Let’s Go Fly a Kite”, “A Spoonful of Sugar”, and “Chim Chim Cher-ee.” You will get a chance to meet plenty of new characters and old, and perhaps even draw inspiration from the cheerful titular character. The original West End production was staged in 2004 and was the recipient of two Olivier Awards, including one for Best Choreography. Well-known for its Mary Poppins the musical makes a return to its roots at the Prince Edward Theatre. The Banks are a well-to-do albeit dysfunctional family living on Cherry Lane in a big house. There is a lack of a strong caretaking figure in their lives since Mr. Banks is constantly working, and Mrs. Banks is always distracted. As a result, the children are spoiled and submit to no one’s authority. The children, Michael and Jane have sent yet another nanny packing due to their bad behavior and are in need of a new one. Mr. Banks is very particular that the family needs a very strict nanny. A mysterious young woman named Mary Poppins shows up on hearing about the Banks’ need for a nanny. She seems very peculiar but is determined and confident that she can teach a thing or two about discipline to the two children. 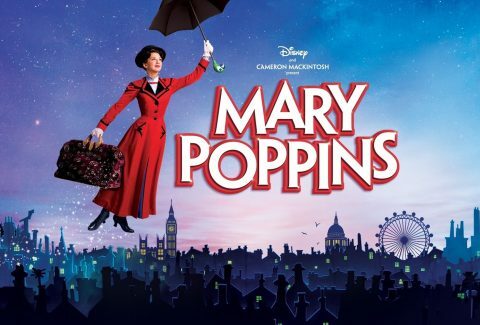 Will Mary Poppins be successful in this seemingly impossible task of straightening the Banks family’s children. The Prince Edward Theatre has a seating capacity of 1644.